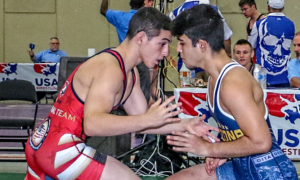 There is always more than meets the eye when it comes to a high-profile Greco-Roman tournament on US soil, and the 2017 Dave Schultz Memorial International was no exception. Several of the sport’s most talked-about stars were on display and though a surprise or two popped up, the end results went largely according to plan. But it is how those results were birthed which tells the real story. The one heartbreak about RaVaughn Perkins (71 kg, NYAC) enduring that spinal fracture last spring is that it happened when he was wrestling the best he ever has. At the 1st Olympic Games Qualifier in Mongolia, Perkins caught fire until being eliminated in the match for true third. Two weeks later in Turkey, the spark was still there, but it could also be sensed that something was holding him back. Well, now we know what it was. What elevated Perkins in the springtime was his confidence. 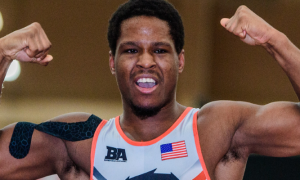 He might have been on the verge of breakthrough success before the Olympic Trials, what with his victory at the 2014 World Team Trials and other strong domestic performances. But it was easy to tell that Perkins’ confidence was surging that day in late April where he came oh-so-close to qualifying 66 kilograms. He carried it over into Mongolia, but his body didn’t cooperate. What was perhaps the most encouraging sign for Perkins yesterday is that if there was any dust to shake off, it wasn’t visible. The bodylock he used to finish off Je Frim Sambula (HON) was acquired with the same approach he used in the first half of last year. Perkins set traps to find positions and once those became open, he pounced. There was no hesitation, which is something you want to see from an athlete returning after an injury. With the new weight class and his first match back a resounding win, he was understandably pleased with the results. Shogo Takahashi (JPN) represented a nice test in more ways than one. 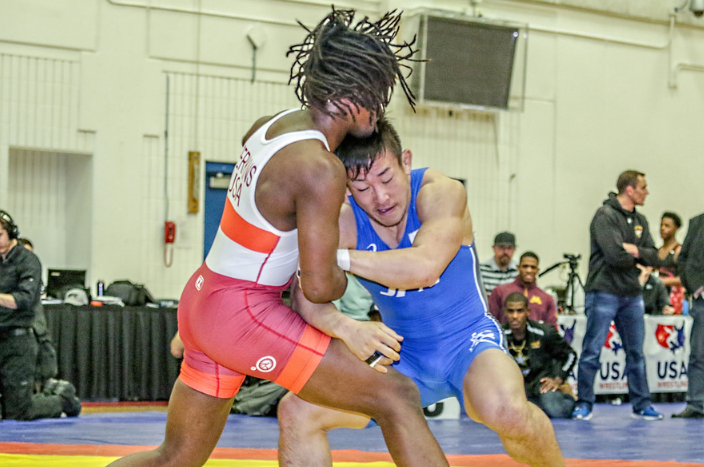 A 2014 Junior World Team member for Japan, Takahashi hasn’t had a ton of international opportunities but knew how to take command against 2016 US Nationals runner-up Anthonie Linares (NYAC-OTS). Perkins grabbed scoring opportunities against Takahashi as they came, for the most part. Like a bloodhound wandering through the woods, Perkins can sniff out worthwhile positions if he knows they will lead to points, which is how he scored on his last takedown of the bout. An arm throw attempt by Takahashi Perkins saw coming resulted in the American scrambling out of and into position, allowing him to get behind for the final two points in a 7-4 victory. It was a successful return to competition, for sure. However, Perkins acknowledges that he wasn’t in optimal condition and looks forward to building on what was a strong day overall. The ability to come back can never be understated. Especially in the finals of a tournament and even more so against supposed rivals. For this example, Kamal Bey (75 kg, Sunkist) presents a more dramatic case than his partner in crime, G’Angelo Hancock (98 kg, NYAC). Bey had competed against Jesse Porter (NYAC-OTS) four times previously, winning three of the contests. 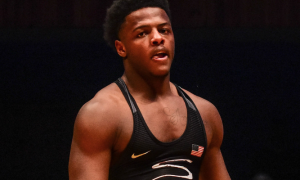 The series started last April at the Junior World Team Trials, as Bey won the first and third in a high-scoring best-of-three final to earn his ticket to France. They met again in December’s US Nationals finals and it was decidedly anticlimactic — Bey threw Porter twice for a frighteningly-quick technical fall and that was that. Their final last night stood out for two reasons. Firstly, it was equally as encouraging to witness Porter stay within himself and negotiate the strengths of his opponent as it was to see Bey not unravel under pressure. Porter has shown he can defeat every notable competitor at this weight, but the consensus might have been that Bey is so far ahead at this juncture that the idea of catching up is a non-starter. Whether that changed or not is up in the air. For his part, the ever-exuberant Bey remained practical about the flow of the match both during and after. He is also convinced that the manner in which he won can serve him well against Porter and other opponents in the future. It isn’t that Geordan Speiller (Florida Jets) had no right winning the 2017 Dave Schultz Memorial International. Even with a pronounced layoff, he was deemed a threat going in and it did not matter that it would be up a weight at 80 kilos. Speiller performing well and winning is noteworthy, but how he did it and who he did it against deserves more attention. 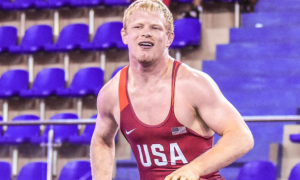 Before yesterday, Speiller was last seen blitzing through the Olympic Trials Challenge Tournament before being shut down by two-time World medalist Andy Bisek (Minnesota Storm) in the best-of-three finals. Quick math says that is just a shade under ten full months. He comes back, goes up to 80, defeats two tough foreigners, one an Olympian, and is named the event’s Outstanding Wrestler. Not a bad way to enter back into the thick of things. What stands out the most about Speiller’s finals victory over Mahmoud Sebie (EGY) is that like Hancock and Bey, he had to come back. Of course, Speiller’s comeback was different. The quality of opponent along with the aggressive, unyielding climb back in set him apart in this regard. Speiller was behind 3-0 in the first period in a chippy affair that wound up working to his advantage. Sebie had looked to make his presence felt by locking up the American’s fingers, roughing up his head, and other various tactics that are common, but usually lead to retribution. Speiller returned the favor here and there, but it was his pace that really won him this match. In the second period and needing points, Speiller let the lack of ordered par terre work for him. He was constantly all over Sebie to where it seemed as if they were operating at two different speeds. Always a dangerous bloke on his feet, Speiller darted in with snap attempts that set up his dynamic duck-unders. The ducks were not successful, but they kept Sebie moving and put him off his spot. Not to dismiss the passivity point that closed the gap from 3-0 to 3-1, but the tide was turning enough to where it already seemed to be a matter of when, not if Sebie would crumble. The crescendo hit with :46 left on the clock as Speiller got to Sebie’s body and and in a flash got behind to secure the takedown. If you saw this match live, chances are you needed to take a deep breath at its conclusion. Ten months away and the kid wins via overwhelming an Olympian. OW? Indeed. Where does Malcolm Allen go from here? There is almost a sense of relief in Malcolm Allen’s championship run yesterday. The Minnesota Storm heavyweight performed impressively in Vegas, particularly when you hone in on the fact that he’s a relative neophyte in Greco Roman wrestling. His bronze medal at the Nationals provided hope that there could be another hoss walking into the saloon at 130 kilos, an important item to consider for a weight in need of depth. The relief is that Allen is indeed, a real, live issue for other 130’s to now deal with, which is a good thing. No, great thing. This conclusion can be reached rather easily based off of his last two events alone. A 3-1 ledger at the Senior Nationals, with the only loss to eventual champ Toby Erickson (Army/WCAP), is strong. Following that up with a Schultz win that includes victories over two foreign opponents? Even stronger, even if they weren’t two ranked studs. Allen amassed a slew of “hustle points” in his first two matches. Against Luciano Del Rio (ARG), he was like a bull in a China shop. Because he’s on the shorter side of this weight class, Allen is able to stay compressed and power his legs forward, and really, just run wild. Naturally, most of his scores come from step-outs and go-behind’s at the edge. 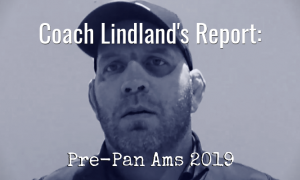 In his semifinal bout versus Arata Sonoda (JPN), an experienced Greco Roman competitor who has appeared in two Senior World Championships (2014 and ’15), Allen used a nice combination of speed and brutish power to stay true to his formula. It worked. Plain and simple, he broke Sonoda, there’s no other way to say it and no one does that better than Storm athletes. Are there deficiencies? Certainly — Allen is bent-over far too often and against more accomplished, seasoned competitors, that is going to be trouble. Greco heavyweights who make a habit out of dropping their heads and bending their backs are like chum to the tall, technical monsters who occupy much of the mat space overseas. But this is correctable. And the good stuff Allen has going for himself is not teachable. See how that works out? 2016 Olympian Robby Smith (NYAC), Erickson, Eric Fader (Marines, and a victim of Allen’s in Vegas) and Jacob Mitchell (Army/WCAP) need Allen to keep progressing one way or the other. So while where he goes from here is tough to nail down, the point is that after yesterday, it’s apparent he’s going somewhere. Curt Calovecchi (75 kg, NMU-OTS) is developing. He’s not there yet. He’s not supposed to be there yet. But yesterday, he showed some signs that there is more to look forward to. A win over teammate Corey Fitzgerald in the consolation bracket gave way to a surprising technical fall victory against Japan’s Kodai Sakuraba. He lost in the third place bout to Dillon Cowan, but Cowan is a beast when he’s on. In other words, it happens. Calovecchi can do something with this and here’s hoping he does. WCAP’s Mike Fuenffinger has existed under the radar but those days are coming to an end. The 59 kilo competitor took out 2016 Olympian Jesse Thielke via throw and fall in the consolation rounds and then stopped Dalton Roberts (NYAC-OTS) via tech before being ousted in the bronze medal bout by Mostafa Mohamed (EGY). Fuenffinger looked strong, agile, and confident throughout the day and with him in the mix, 59 looks even scarier. How about John Stefanowicz (80 kg, Marines)? He started off by giving rugged vet Cheney Haight (NYAC) a hard time in a 9-6 opening round loss. 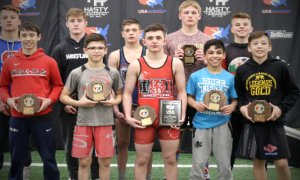 But he recovered well enough to pile up points against fast-rising Barrett Stanghill (Minnesota Storm) in the consolation quarters. He missed out on a medal but if he can’t find encouragement from his performance yesterday, he should get his head checked.